Recovery Point Objective: Worse case data loss is acceptable for applications for a disaster event. 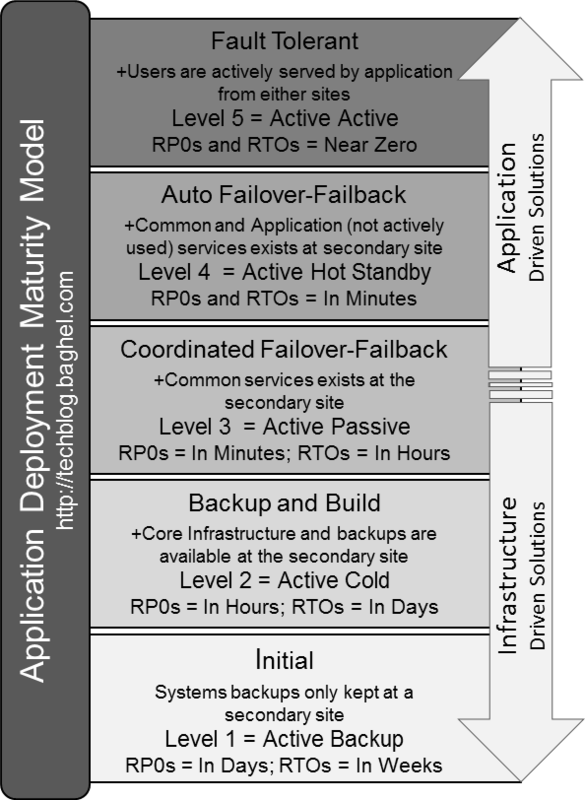 Recovery Performance Objective: Application need to perform at the same level as primary site or we can limit user access or ok to have degraded performance for applications if disaster happens. Recovery Functionality Objective: Functionality of applications needed at same level as primary site or can they operate with limited functionality. We often find that these objectives together help us define DR tiers such as Platinum, Gold, Silver and Bronze to fit into a budget to delivery DR capability for an enterprise. Transformation of proprietary implementation of Load Balancers and Security Controls in WAF, Firewall, IPS/IDS etc. Transformation of services/systems deployment life cycle management tools and processes such as monitoring, backup and recovery, automation (config, build, patch and deploy), ITIL etc. The Application-2-Infrastructure Mapping for an application is the information about the network, compute and storage used for the application system deployment. 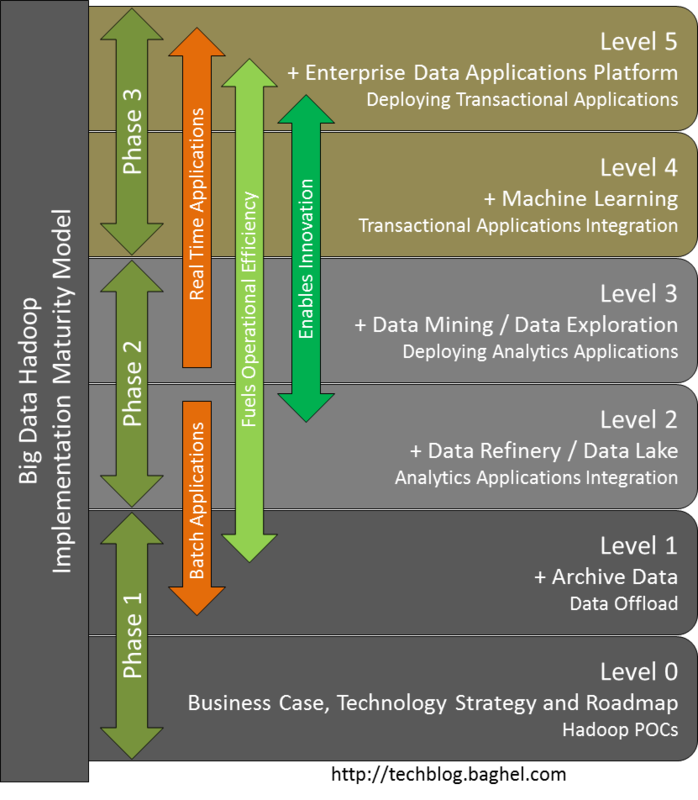 Application-2-Infrastructure Mapping is mission critical for system deployment life cycle. In most organizations, the Application-2-Infrastructure information is not easily available and often it is tribal knowledge. There are tools in the market claims to auto-discover and create the mapping for you. The reality is that there is no tool in the market that can auto-discover and create Application-2-Infrastructure Mapping for an enterprise applications portfolio. The first iteration of creating Application-2-Infrastructure Mapping is manual in nature. The Mapping tools such as BMC ADDM and HP ADDM will auto-discover the infrastructure elements also known as application elements but application owner needs to define the mapping rules. The tools have a library of these rules for some of the popular applications technology stack that doesn't cover 100% of an enterprise application portfolio. The standard library often misses covering the custom implementations for a popular applications technology stack. Fault Tolerant: No impacts to the services to users in the event of disaster scenario and users consumes services actively from multiple data centers all the time. This model is also known as multi site active-active deployment. Auto Failover:In the event of disaster scenario users are routed to the disaster recovery site. 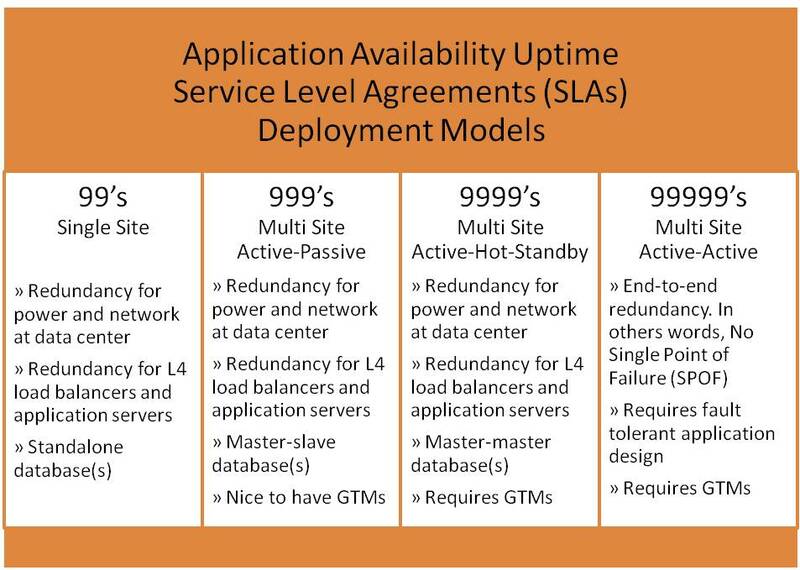 This model is also known as multi site active-hot-standby deployment. Coordinated Fail-over: Someone needs to call out that it is a disaster event and services platform administrators’ runs configurations updates to make services available at the disaster recovery site and then update configurations to route the users at the disaster recovery site. This model is also known as multi site active-passive deployment. Backup & Build: You will stand up services platform systems from backup and build at the disaster recovery site. You will run minimum verification to ensure that services for users are restored as expected and then manually route the users at the disaster recovery site. This model is also known as multi site active-cold deployment. 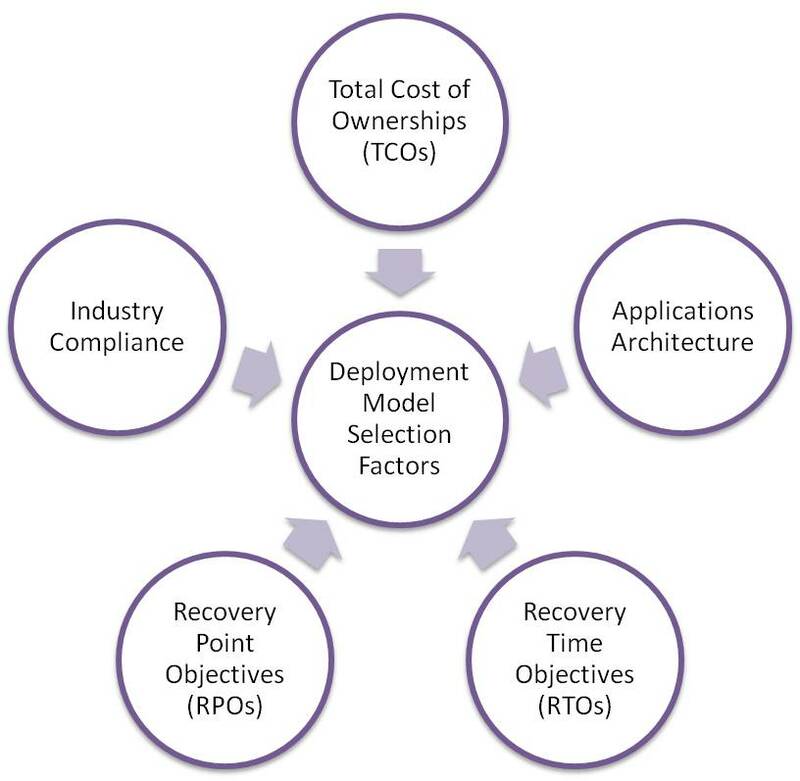 The diagram suggests the factors that needs to evaluated to select a DR deployment model for an application platform. In an enterprise, you will find multiple DR deployment models to meet needs of the entire applications portfolio economically.